This article gets into the Jerusalem Sovereignty that the Templars were formed to protect, and the call of the Gothian Nobility (Visigoth and Ostrogothic houses united). + Our Order has Successor Knights of the original local Grand Commanderies in England, in Germany (Saxony/Brunswick), Czech and Poland. The missions of the Templars weren't only engaged in the Holy Land, they also worked to keep the peace at home. 500 Knights Templar defended Poland against the first mongol invasion. What is the definition of a Knight (Chivralic) in international law? We must get this definition right. There must always be to one with true sovereignty that you swear fealty to. Historically any militant that protected the lands of their lord (from whichever organization locally) were called Chivralic or Knights. Landlords could divide their lands under a "Knights Fee" structure. All who lived under their Knights Fee paid fealty to their Lord. This is demonstrated by Lord Henry le Notte (House of Nott) who is recorded as holding the "Knights fee" land of Preston Bagot in the year 1235. This was the Balshall Commandery, and was the Grand Commandery for all of the Warwick region Templars. Eventually 6 Templars were arrested there at Ballsall and this "Knights fee" was later transferred to the Knights Hospitallers. This specific Knight's Fee was was stolen, and yet the house of Nott has maintained the cause ever since that this Templar land was wrongfully stolen. Several chroniclers and Nobility experts have shown that this Temple Balsall was part of the earlier Earldom held by the House, and the Knights were directly under those who bore the distinction of Earls. These lands of Kineton were written in a Charter of King Edgar, as the family's "eternal inheritance". These Templars who were living on the land lived there in the process of Subinfeudication to His, as the Templars did wherever they were. The local Abbot's name was William the Templar of Reading Abbey, who later became an Archbishop. These were the practices and laws. In English law, a tenure of lands by knights service; that is, by the condition of performing service on horseback, or of performing some noble or military service to his lord. This was general or special; general, when the tenant held per servitium militare, without specification of the particular service; special, when the particular service was designated. When the tenant held only of the king, the tenure was regal; when he held of a common person, it was called common. This service was also grand sergeantry, as when the tenant was bound to perform service to the king in his own person; and petit sergeantry, when he was bound to yield to the king annually some small thing, as a sword or dagger. chivalry that might be held of a common person, was called escuage, scutagium, or shield service. Websters Dictionary 1828 - "Chivalry"
So we can see also commoners can be Chivralics (or militia) of the Templars. (Once initiated into the ways of the order of course.) These provided service to their land lords to keep the peace in any area they operated. If they had an allegiance back home that conflicted with the Jerusalem commanders, these would be up to the commanders to settle. Such a conflict took place in the earliest times of the Templars in England with the "Otun milite Templi", and several other supports to keep order within the realm. Other times have been documented like the time of King John, the aftermath of the signing of the Magna Carta, etc. Militia of the Templars in local matters is known not only in England but throughout Christendom, helping assist locals in times of need. Till the 1300's there were very good relationships of the Templar and the people. The example shown of the Knights Fee of Preston Bagot "fee-in tail" to the House of Nott, was just one of many flourishing commanderies (now called a Preceptory) by the locals. These often had allegiancies at Jerusalem which could have conflicted with the allegiances back home. However they still were Templars. These principles of Chivalry exist within the Templars today. There is a lot of mis-information on the facts of the Templar structures. Some are stuck in the false belief that Monks couldn't own any lands. However, that has long been established Monks could both marry and own lands. As the Culdee were the primary Chaplains for the Templar, they serve as a good example of such structure Glastonbury/Culdean Married Abbots and Monks. However it is true that some local units of monks would add extra vows upon themselves for more protections in battle. There has always been an autonomy for each commandery and each monestary to place on vows unique to their jurisdiction. Templar sovereignty has been consistently maintained for the the Christian Jerusalem lands and their purpose in protecting those sovereignties, whether they be protecting Royal and Ecclesiastical titles (ie King of Jerusalem, Princes, Barons, Bishops, Archbishops or Ranks of the Templars), or whether they be protecting Christians who are seeking citizenship in the Kingdom. The Templars protect and support many lines of Nobility that maintain Jerusalem titles as their inheritance. There have never been just one named King and/or Princes, Queens and Princesses of Jerusalem at any given time since the Crusades. There have always been numerous striving for restoration of the Kingdom. However the House of Brunswick and House of Spain have some of the strongest claims. The most vocal and widely recognized Royal Houses posessing the Sovereignty of the Kingdom of Jerusalem today is the Visigothic Family ( Idalgos - Adel Gothas) of the House of Spain. They have maintained the titles of Kings and Queens of Jerusalem as their family inheritance. The Visigothic lines gained more wider acceptance during the times of Ferdinand and Isabella. This goes back to their Visigothic (Spanish and Gothian) lines, of which also the House of Brunswick / Gulephs has maintained a share of these rights within the Knights Templar. From ancient times the Guelphs/Welfs (House of Brunswick) were protectors of Naples and other Italian states where their Kings became the Kings of Jerusalem. One example being King Charles II of Naples, King of Jerusalem. There are many other examples of those with the title "Prince of Gothia" used the title King of Jerusalem. The article gets into succession of the houses of the Visigothic Nobility(Toulouse Gothia), the Ostrogothic Nobility (Amelung/Billung) of the Dukes of Saxony, the early Emperors. Furthermore, the "Principality of Gottingen" is the alloidial capital of the House of Brunswick. Numerous Royal Houses also maintain the titles of Jerusalem within their inheritance. Examples abound. Brunswick is one of those houses, via the house of Anjou. The House of Brunswick is living Nobility, and are direct successors of the original founders of the Templar (of Anjou), the two who were Grandmasters BEFORE the pope endorsed the Templar. Our family, and those aligned with us use both our family's Anjou coat of arms and Templar coat of arms. Henry the Lion (of Brunswick) became a major player in the Crusades and the Templar. The eldest son of Henry the Lion and Matilda was presumptive heir of Anjou (and King of England). He was heir of Anjou. The first and second Grandmasters of the Templar were of this Angevin Dynasty (Anjou). These first two Grandmasters were fully operating the Templar Order without any consent of the pope. The House of Anjou founded and led the Templar for generations, long before there was any endorsement by the pope. These original Grand Masters were of the Visigothic Nobility click here. A generation before them, the "Prince of Gothia" had called together the first Templar at Jerusalem click here. As Henry the Lion's, son Henry V, was their Angevin successor, it makes the house of Brunswick a worthy topic of interest for any who call themselves Templar. 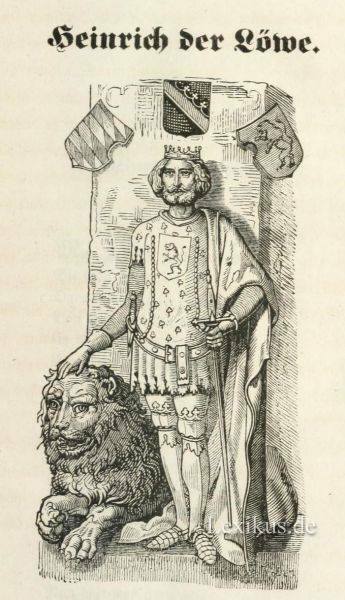 Henry the Lion founded numerous Templar Commanderies in Brunswick Germany. It is also noteworthy that Henry the Lion's third son via Matilda of Anjou was Otto IV, and he became Holy Roman Emperor. The Queen of England today also carries the title of Jerusalem. The whole world witnessed when on syndicated TV, the Queen of England was pronounced "Queen of Israel" by the Archbishop at her coronation. For three centuries these titles of Jerusalem were proclaimed at England over the House of Brunswick during the reign of Hanover. However, most do not know that in the House law of Este-Guelph Brunswick, Hanover is the Junior branch, and Brunswick-Wolfenbuettel is senior. It doesn't matter that Hanover was made an electorate within the Empire as our house has always been arch-rivals of the Habsburgs for the Imperial crown. Still all parties of the house recognize that Wolfenbuettel is senior. Still the original compacts and laws hold precedence at the founding of the house. For 300 years this Junior line of Brunswick, known as the Hannoverian Kings of England, had this title "King of Israel" pronounced over them by the Archbishops. Still within the house law the senior branch Brunswick-Wolfenbuettel-Oels must be restored. This title "King of Jerusalem" has not only been part of the Angevin house of Brunswick since ancient times, it has remained operating to this present day. During the French wars against the Royalist Templars Napoleon killed half a dozen Dukes of Brunswick, including the Grand Master of the French Templars, Louis Hercule Timoléon de Cossé-Brissac. He had become Grand Master in 1776, and was killed during the French Revolution in the cause of the Royalty. In the aftermath of these wars, Hanover was bribed to press fraudulent claims over the senior House Brunswick younger surviving Heirs. Most of the allies of the senior line of Brunswick did not buy these claims of Hanover that they could cause Brunswick to be disinherited by the senior branch. The German federal government did not agree with seizure of Brunswick lands, and stipulated that although the lands are stolen, the heirs of the senior line should inherit (copies are in our possession). The Swiss and French courts still did maintain inheritance as belonging to the senior line Brunswick Heirs. Demands from the Emperor of Austria to restore the senior branch, and not to have Hanover invading or intermeddling with their neighbor senior branch. (These are also in our posession.) The Emperor of Austria cataloged several matters of established international law in regards to the succession of the state and intermeddling of Hanover. They conclusively proved the matters of dethroning the younger children of the last duke were in violation of the law by interfering with the continued inheritance to the senior line of Brunswick-Wolfenbuettel. This has been republished in France, in books that demonstrate this all was illegal. Since the Brunswick youngsters were unlawfully and forcibly removed, history has been systematically attempted to be re-written as it concerns the Kingdom of Jerusalem and the Templars. "Oels Commandery Knights and Elector Abp. Stephen, Grand Commander for BENELUX"
Protest was delivered to Heinrich von Hanover in 2009 before commencement of the 200th year anniversary of the Brunswick Ducal Guard ceremonies. All of the parties had met at the anniversary celebration of the Black Legion at Brunswick-Wolfenbuettel as representing the mourners who raise continual petition against the suppressed Principality of Brunswick-Wolfenbuettel-Oels. Nevertheless, at Jerusalem there has remained a plea by the Clergy to restore the Crusader Kingdom of Jerusalem. There have consistently been Roman, Egyptian Coptic, Byzantine, Greek, Anglican and other church Bishops and Archbishops stationed at Jerusalem for the restoration of the prophesied Kingdom. This is additional proof of the continual protest and maintenance of the Christian Kingdom of Israel as maintained in the majority by those who are successors of the founders of our religion. The Clerics all have had autonomous princely authority like the Pope of Rome. Non-Roman Bishops (and many independent Abbots, ie Glastonbury) worldwide have had equal sovereignty as the Pope of Rome. It wasn't only the Eastern Church who has popes that are paid equal respects. The Western church (ie Columbanus the Culdee) has always had ours, though more suppressed. Rome kept some preeminence claimed in the West. However, it wasn't with such power really until Mussolini granted the Papacy with a bit more sovereignty. That is the current sovereignty they actually enjoy today as a state. However, before then, sovereignty of ecclesiastical institutions were still respected, and will continue to be in future times. Numerous charters of the Pope and numerous Monarchs confirmed such sovereignties are belonging to the Abbots and Clerics of Glastonbury. The Jerusalem jurisdictions are distinct entities and lands that belonged to our forefathers. This struggle is central and continuous to every shade of Templar order and a great many orders of Knighthood. Templars have consistently retained an autonomous nature, and have been preserved not only in Masonic lines in more than a dozen nations (under Thousands of law officials up to and including the Monarchs of the nations), but has been especially retained by Royalists in non-Masonic German, Non-Masonic Scottish, and Non-Masonic French courts. In "Mill's History of Chivalry" (19th Century Historian) it says that "the order of Templars have never been dissolved, but only suppressed". He lists the successful transmission to de Molay's successor which he performed as soon as he suspected he would be a martyr. Several other authorities on chivalry, like Mills, at the time wrote much more on the perfect transmission of Templars to these days. These included Sutherland, de Magny, Dumas, Burnes, and Gregiore. The Charter of Transmission was republished under this title "Sketch of the History of the Knights Templars" with approval of the crown in 1840. Within the book it included several other charters such as from King James the IV of Scotland re-confirming the inheritance of the Templars in the sixteenth century. This publication constituted force of law on behalf of the Templars. This is upheld in the British Crown Office Act of 1877, Section 3.3. Since prior approval was made, it thus created a binding legal fact of public law, by force of law. Queen Victoria's son, King Edward VII also reconfirmed these (and many other charters) when he was Grand Master of the English Templars. did not happen with the Templar estates in Brunswick, nor in Scotland. In Scotland King James IV acknowledged this. He confirmed all former grants of land made to "Sancto Hospitali de Jerusalem, et fratribus ejusdem militia Templi Salomis". This reference to the Templars is said to prove that the Templar Order maintaned an existence that was united with the Hopsitallers. Even to this day all Brunswick Houses on the Hospitallers maps of estates still list these as Templar properties. In numerous examples the Dukes of Brunswick reconfirmed the authority and titles of the Kingdom of Jerusalem in maintaining these Templar houses in Brunswick. They continued as Protectors, Grand Masters, and Grand Priors over the Templars. This only became covered up during the French revolution and culmination of the Napoleanic wars killing the vast majority of the Jerusalem Templar Nobility and Royalists. The following commanderies under the Hospitallers Bailwick of Brandenburg show their present commanderies in Braunschweig, Supplingenburg, Tempelhof, and Tempelburg all listed as Templars (or formerly Templars in the most recent records). This is not done for any other European Hospitaller Commanderies. The rest are just listed as Hospitaller commanderies. "The chain of transmission is perfect in all its links. Jacques de Molay, Grandmaster at the time of the persecution, anticipating his own martyrdom appointed as his successor in power and dignity, Johannes Marcus Larmenius of Jerusalem, and from that time to the present there hsa been a regular and uninterrupted line of Grand Masters. The charter, (high quality scan is available), by which the supreme authority has been transmitted, is judicial and conclusive evidence of the Order's continued existence. This Charter of transmission, the the signatures of the various chiefs of the Temple, is preserved at Paris, with the ancient statutes of the Order, the rituals, the records, the seals, the standards and other memorial of the early Templars.
" The brotherhood has been headed by the bravest cavaliers in France ; by men who, jealous of the dignities of knighthood, would admit no cor ruption, no base copies of the orders of chivalry, and who thought that the shield of their nobility was enriched by the impress of the Templars' red cross. Bertrand du Guesclin" was the Grand Master from 1357 till his death in 1380, and he was the only French commander who pre vailed over the chivalry of our Edward III. From 1478 to 1497, we may mark Rohert Lenoncourt, a cavalier of one of the most ancient and valiant families of Lorraine. Phillippe Chabot, a renowned captain in the reign of Francis I, wielded the staff of power from 1516 to 1543. The illustrious family of Montmorency appear as Knight Templars, and Henry, the first duke, was the chief of the Order from the year 1574 to 1614. At the close of the seventeenth century, the Grand Master was James Henry de Duras, a marshal of France, the nephew of Tur- enne, and one of the most skilful soldiers of Louis XIV. The Grand Masters from 1724 to 1776 were three princes of the royal Bourbon family. The names and years of power of these royal personagos who acknowledged the dignity of the Order of the Temple, were Louis Augustus Bourbon, Duke of Maine, 1724-1737 ; Louis Henry Bourbon Condi, 1737-1741 ; and Louis Francis Bourbon Conty, 1741-1746. The successor of these princes in the Grand Mastership of the Temple was Louis Hercules Timoleon, Duke de Cosse Brissac, the descendant of an ancient family, long celebrated in French history for its loyalty and gallant bearing. He accepted the office in 1776, and sustained it till he died in the cause of royalty at the beginning of the French Revolution. The order has now its Grand Master, Bernardus Raymundus Fabre Palaprat;1 and there are Colleges in England and in many of the chief cities in Europe." Besides this general history by an authority on chivalry, the other points in this article have has been clearly recognized in international law in relation to many aspects of inheritance and transmission. While the Masonic side when not directly under a monarch has been still fraternally seeking the restoration of the Kingdom at Jerusalem. So on all counts, the points of sovereignty remain irrefutable in the striving for the restoration of Kingdom at Jerusalem. Every Christian who professes any of the basic tenants of our faith maintain this struggle. Act 1:6 KJV - 6 "When they therefore were come together, they asked of him, saying, Lord, wilt thou at this time restore again the kingdom to Israel?" We all pray His prayer "Thy Kingdom COME and will be done on earth.."
We are told for the necessities of life, we must "seek first the Kingdom of God(like Davidic prophetic Kingdom), then all these things will be added unto you." These things are believed in every branch of Christianity. Militant Christians who believe, all look toward this coming Kingdom of which all the nations and all twelve tribes (not just the one tribe of Judah) will be dominating. These are all built on the sovereignty of Jerusalem and Templars that are without question operating. Only recently these questions and re-writing of history has come in. It is not only belief, but a consistant striving among all including those who havent been under the Jerusalem monarchs for a few centuries(near 100 American Templar groups). There is a common oath to strive toward the east. It's not only beliefs of all Christians, faith without works is dead. Proof we believe is shown in actions as all Christians should become Templars, and become a part of reestablishment in the East (at Jerusalem). The actions are also abundant that back up the complete belief in the whole book, which culminates in this Jerusalem Kingdom. Faith without works is dead, and whatsoever is not of faith is sin. Romans 10:17 says "Faith comes by hearing the spoken word", so gather around and support those who speak the word to help convert the lost and bring them into His fold. The numerous Kings and Queens of Sovereign Nations being Grand Masters of the regional and National Grand Commanderies testify exhaustively to these facts of continued sovereignty of Jerusalem and the striving of all Christian Israelites to restore it. Within any of the above forms have been a great qualification of the transmission of sovereignty of the Kingdom of Jerusalem. Yet still many are uneducated. "My people are destroyed for a lack of knowledge". We must educate them about the law and their heritage. We have copies of the most well known lawmen of Britain, France, Scotland and Germany as fighting for this Kingdom of Jerusalem through the order of Templars which protect it. In Britain alone we have a list of more than 1,000 very high ranking people in British society from the 14th to 19th Centuries who openly identified themselves as "Templars". These being in all levels of distinction in the records of the Law — Judges, Advocates, Jurists and the like; and the majority. click here to read the catalog of notable British Templars (post 14th century) in full. Together with the Metropolitanate of Gothia (Crimea) His Excellency has secured cooperation agreements with the successors of the Visigoths and has received recognition from the Gothian Church jurisdiction. A Constitution was agreed. On February 7th, 2015, the American Orthodox Catholic Church anointed His Excellency Abp Stephen Michael as Imperial Elector and successor of Visigothian and Ostrogothic nobility. This is recognized within the church, but it is a matter of international law as it concerns the head of the house of Brunswick-Wolfenbuettel-Oels, who is chief of the House of d'Este-Guelph. Henry the Lion became a major player in the Crusades and the Templar. As Henry the Lion's, son Henry V, was their successor, it makes the house of Brunswick a worthy topic of interest for any who call themselves Templar. 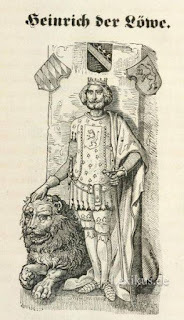 One of the most elite of our forbears was Henry the Lion. (d. 1195), duke of Saxony and Bavaria from 1156, the leader of the Welf family, the most powerful princely dynasty in Germany after the Staufen imperial family. He is the most prominent forefather of the House of Brunswick (Braunschweig-Wolfenbeuttel). He had made great accomplishments on behalf of the Templars and regular Pilgrims at the Christian lands of Jersalem and at home. He had also founded Templar military houses all over Germany. Within Brunswick alone there are numerous examples. The Templar houses at Brunswick in Osphalia and at Supplingenburg and Bodenrode, at Brunswick Castle, at Emmerstedt, at Hagen, Kattreppeln, Küblingen, at Königslutter and many more Brunswick Imperial, Ducal and Princely sites! On his way to the holy lands he would take passage through Constantinople. Frederick I Barbarossa had reopened diplomatic negotiations with Byzantium and so it was the best option. He was highly respected by Emperor Manuel I Komnenos at Constantinople. At the Holy Land his caravan was attacked by Saracen troops. So while he was there only on Pilgrimage and for diplomacy, it did happen he participated in some pitched battles. However these were not considered any of the larger official battles. On his arrival at Jerusalem he was met with considerable pomp, and received in state by the Crusader King Amalric. In an extended account of the journey, Arnold of Lubeck in his "The Chronica Slavorum" described how Henry was met outside the gates of the holy city by the Knights Templar and Knights Hospitaller. He gave three eternal lamps to the Church of the Holy Sepulchre: one for the Holy Sepulchre, one for Golgotha and one for the relic of the Cross. Arnold goes on to relate how Henry gave arms and a thousand marks to each order to help pay for lands that would support their troops. The Templars accompanied him to Bethlehem and Nazareth and bade farewell to him at Antioch. From Antioch, despite an offer of safe-conduct from the Armenian ruler of Cilicia, the duke preferred to travel by sea to Tarsos (mod. Tarsus, Turkey) on ships provided by Bohemund III, prince of Antioch. From there he was escorted by Turkish troops to meet Qilij Arslān II, sultan of Rûm, near the latter’s capital of Ikonion (mod. Konya, Turkey), where again he was received with great respect and laden with presents. Henry subsequently returned via Constantinople and the route through the Balkans by which he had come, reaching Bavaria by December 1172. The most significant consequence of his visit was the establishment of friendly relations with the Saljûq sultan of Rûm. These diplomatic contacts set a precedent for Frederick Barbarossa’s negotiations with QilijArslān II in 1188-1189 as he attempted to secure an unopposed passage for his army across Asia Minor during the Third Crusade (1189-1192). According to legend, Henry witnessed a fight between a lion and a dragon while on pilgrimage. He joins the lion in its fight and they slay the dragon. The faithful lion then accompanies Henry on his return home. After its master's death, the lion refuses all food and dies of grief on Henry's grave. The people of Brunswick then erect a statue in the lion's honour. The legend of Henry the Lion also inspired the Czech tale of the knight Bruncvík, which is depicted on a column on Charles Bridge in Prague. The Gothian Imperial Knights Templar hope many more will join us in the upcoming investiture ceremonies and lectures at the Olesnica Castle, Poland. We will be regularly utilizing the Knights Hall for these purposes. This Castle was also home of the last ruling Emperor of Prussia at the end of WWI where he died in exile. It is also the last resting place of our senior line Dukes of Brunswick that were fully recognized worldwide for the Imperial Princely House of Brunswick until 1884 (and now a surpressed cadet branch). This was up until recently the headquarters for the Order of Deaths Head, re-organized under the Prince Wilhem von Brunswick at His Oels castle. After Napoleon had sacked Brunswick, and killed half a dozen Dukes on various fronts of the war, the Duke retreated there to Oels to recruit Germany's Black Legion. They almost all were recruits from this Slavic German Principality of Oels-Bernstadt. However, this was nothing new. Even to the time of the Templars these all were directly under loyalty and command from our House headquarters first in Gottingen and later in Wolfenbuettel for 900 years.Vast areas of this part of Silesia were given by the regional nobility to the Templars. It is estimated that half of this large region of land was founded by Knights Templar. Bakow-Bankau, Hennansdorf-Kowalów , and Güntersdorf-Czestoczice Commandery. These were all subordinate to the Klein Oels Grand Commandery from the year 1200 which was subordinate to the Brunswick Priory for the greater amount of history. At least from 1303, when Otto von Brunswick became Comtur of the Order of Knights Templar at Süpplingenburg, Braunschweig. The House of Brunswick to this day have maintained the title in international law, known as "the Prince of Oels". "Brunswick-Oels" is the official spelling on numerous legal patents. The Kings and Queens of the House of Saxony also co-support this title, which keeps it alive on numerous fronts in international law. Today this jurisdiction is under the Gothian Imperial Knights Templars. The regional Templar Commandery of Oels answers to the House of Nott-Brunswick, where ++Abp. Dr. Stephen Michael of BENELUX rules as Elector(Gothian Prince-Bishop) and with the Benelux jurisdiction, this has effectually revived age old Brunswick rivalry for the crown of Burgundy. It was originally secured by Emperor Otto IV of Brunswick who, and was also King of Burgundy. Currently the rivalry is between Prince-Bishop Stephen Michael and King Felipe VI of Spain. It was at this region of BENELUX that the "Black Duke" (of Brunswick), Commander of Germany's Black Legion, fought at the head of the army that ultimately defeated Napoleon. He died gloriously in battle at Quarte Bras Belgium. The BENELUX Grand Commandery Knights all swear allegiance to the House of Brunswick. Together with the Ducal Guard of Brunswick, the Elector Stephen Michael Nott d'Este Guelph Brunswick met at ceremonies at the Wolfenbuettel Castle, and promised to those gathered he would work to revive Europe's Black Legion (at least ceremonially). ++ Stephen was invited to participate with the Ducal Guard of Brunswick on the 200 year anniversary of the Black Legion. This 200 year anniversary was celebrated by thousands at the event at Brunswick-Wolfenbuettel castle grounds. Medals were awarded to the Guard and participants onsite and to various members enlisted later on in the year. More than 100 men were in full Brunswick Ducal uniform, and half of them with the elite Husar regiment of the Duke's Order of Death's Head. Thousands who attended were only celebrating for historical reasons, however, many were mourning and petitioning for restoration of the Dukedom. Several Princes, Princesses, Dukes and Barons who attended the event recognized the Guard as the true Ducal guard. These were invited also to be ceremonial guard at weddings and other royal events. The portion of the Brunswick and Imperial Kingdom that was known as Burgandy is now named in part of the BENELUX Jurisdiction of ++Stephen where he operates as a spiritual overseer for the Orthodox Church of the Culdees, as well as Elector for the Gothian Empire. This was confirmed in the Orthodox Church by three Archbishops at a special chapel nextdoor to the ministry of foreign affairs at Berlin, where the consecration ceremony took place. The map of these territories is expanding as membership and local representatives grow. As Stephen Michael is heir to the crown of Charlemagne, as was claimed by his great Grandfather Charles II at Geneva, he wishes to share in this Nobillity for others. This he believes is the will of Christ. On the day of His anointing by the Orthodox Church at Berlin a miraculous event occured. ++Stephen was being anointed and recognized as Prince within the American Orthodox Church. It was the same day the regional highest Roman Catholic Archbishop of the Netherlands was sacked from office by 300 churches who signed a letter to the Pope, demanding He be dethroned and make way for an Orthodox priest. It was the biggest news on TV and radio. The Archbishop of Utrecht was ceremonially and officially dethroned, and Elector Abp. Stephen was installed at the same moment. They announced the older head of the regional church was no longer their leader. However, he is still in possession of some church grounds. This was a sign from heaven that God wills it (DEUS VULT). For these and many more confirmed reasons we think the BENELUX Grand Commandery is best served by such an active leader from the House of Brunswick (cadet branch). Elector Abp. Stephen is the Grand Commander and co-equal Elector of the many state Electors within the Gothian Empire. Who are the Gothian Imperial Knights Templars? The (GIKT) Constitution reflects these most vital matters of our order. We are a neo Templar organization, having Apostolic and orthodox traditions paramount. We have a also successors of the original Avegin line Grandmasters in our commanderies. Like the most earliest Templars we believe that Guarding Christian ceremonies, lands, holy sites, and processions (or Christendom in general) is the most vital part of the order. We pre-date the papal endorsements by a few generations. We protect Christianity at home, and later to once again to protect it at Jerusalem. We are Orthodox, meaning we follow the Daily Divine Services that are established in Christendom.